With their feet firmly “stuck on the gas pedal,” Boeing and Airbus are accelerating narrowbody production to meet the demands of hungry airline customers. As Airbus and Boeing consider cranking up production to dizzyingly high rates, some industry insiders are wondering if the supply chain can keep pace with the aerospace titans’ ambitions. Narrowbody airplanes—the A320 and 737 families—are driving the rate increases. Airbus plans to turn out 60 A320s per month next year. 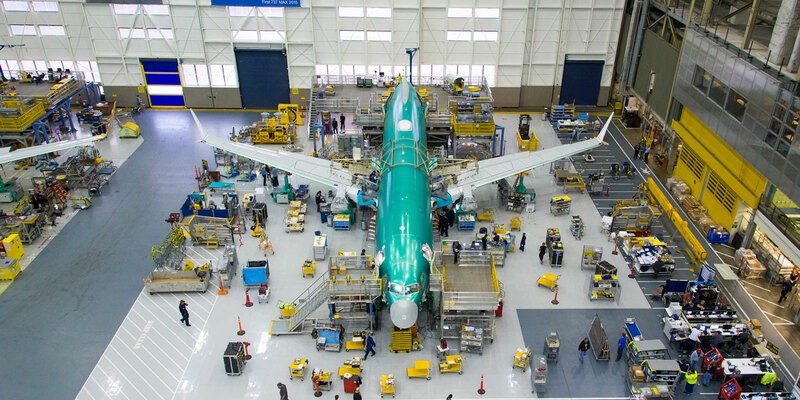 Not to be outdone, Boeing plans to take 737 production to 57 airplanes per month in 2019, and it is studying 63 and 70 per month beyond that. “That foot is still stuck on the gas pedal, and we haven’t seen it come back up,” Airbus Americas head of strategic procurement Giuseppe Marcheschi said at an industry event earlier this year near Seattle. Engine makers are struggling to keep up with current production rates, though. Dozens of Airbus A320neos are parked—engineless—in Toulouse and Hamburg, waiting for Pratt & Whitney to catch up on deliveries of its Geared Turbofan (GTF) following technical issues. The situation is so extreme that Airbus Commercial Aircraft’s new president, Guillaume Faury, called it an “industrial crisis” while speaking to media at an International Air Transport Association summit in May in Sydney. CFM has had delivery delays, albeit far less severe, with its Leap engine, which is available to power the A320neo and is the exclusive powerplant on Boeing’s 737 Max. Boeing previously has said that CFM Leap-1B delays have not affected deliveries. The engine OEMs largely have chalked up the issues to teething problems that accompany any new technology evolution. And few manufactured goods today can rival jet engines in terms of complexity, durability, and precision. Few vendors are certified or even capable of providing components meeting those exacting requirements. Several industry insiders said they doubt engine makers can keep pace as Boeing and Airbus speed up production. Precision castings and forgings, and specialty processes such as hot isostatic pressing, are most vulnerable to bottlenecks, said several analysts and suppliers familiar with those segments. There has been substantial consolidation in castings and forgings in recent years. It takes time to certify new suppliers or for existing ones to expand capacity. Washington State’s aerospace hub—one of the biggest in the world—faces a shortage of plating and finishing processors. That could cause bottlenecks for the region’s machine shops, which churn out components destined for Boeing and Airbus aircraft. Raw materials are an overlooked vulnerability of the global aerospace supply chain, said Kevin Michaels, managing director of AeroDynamic Advisory, based in Ann Arbor, Michigan. As the industry’s demand for aluminum increases, the Trump administration has imposed tariffs on aluminum imports from several major producers. In April, it barred the Russian firm Rusal, the world’s second-largest producer, from importing aluminum into the U.S. The administration later delayed implementing the sanctions for six months. Regardless, aluminum prices have gone up, exposing machine shops and other suppliers to price fluctuations, Michaels said. With OEMs pushing the supply chain to its limits, any stumble could have far-reaching consequences to production schedules. Russia responded to the Rusal sanctions by threatening to cut off titanium exports to the U.S. Russia is the world’s largest titanium producer. “There’s not enough capacity to make that up if Russia cuts off titanium,” Michaels said. Moscow’s penchant for cutting off its nose to spite its face is shrinking but can’t be dismissed, said Mark Galeotti, a veteran Russian expert and principal director of Prague-based Mayak Intelligence.